MASCOT long-sleeved shirts are the perfect choice, if you want to appear professional in your work. If you work e.g. in an office, within construction or logistics, you can easily find a stylish shirt for the purpose. 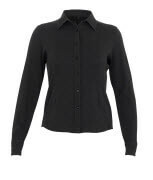 MASCOT long-sleeved shirts can easily be combined with additional workwear from MASCOT. It could be e.g. a knitted jumper or a sweatshirt if you want to dress in multiple layers. In MASCOT® CROSSOVER, you will find long-sleeved shirts in a variety of classic colours. This enables you to combine the shirts with other products from MASCOT, so you can put together the workwear with the expression you want. The shirts are available with several functional details. You will find, among other things, long-sleeved shirts with chest pockets with flap for storage of your mobile phone. The shirts are also available with stiffened collars, which ensure that the collars are always in place. All MASCOT long-sleeved shirts have adjustable buttons at the wrists. The MASCOT long-sleeved shirts are available with different fits in order to give you great comfort and freedom of movement, no matter your preference regarding fit. You can choose between a slim fit or a loose fit, depending on what you feel most comfortable in. The long-sleeved shirts are available in various weavings such as oxford, poplin and chambray. The oxford weave gives a textured fabric structure where the poplin weave provides a smoother fabric structure. The chambray weave is a finely woven, smooth and sturdy cotton material with a denim look.